For traditional health systems and physician groups, embracing the Accountable Care Organization (ACO) model is no easy matter. Value-based care has turned the tables on traditional fee-for-service reimbursement, rewarding providers instead for keeping an entire population healthy regardless of engagement status. Even before the advent of value-based care, though, pioneering medical groups and health systems were deploying population health solutions to drive higher-quality, more efficient patient care at a lower cost. With each new success, they have refined the roadmap for achieving truly impactful population health management. Bon Secours Virginia Medical Group (BSVMG), a hospital-owned multi-specialty group practice with more than 100 locations in metropolitan Richmond, Va., is one such pioneer. 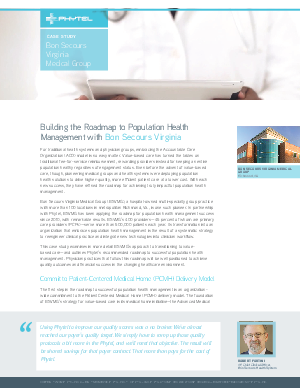 In partnership with Phytel, BSVMG has been applying the roadmap for population health management success since 2010, with remarkable results. BSVMG’s 400 providers—45 percent of whom are primary care providers (PCPs)—serve more than 500,000 patients each year. Its transformation into an organization that embraces population health management is the result of a systematic strategy to reengineer clinical practice and integrate new technologies into clinician workflow.